PHOTO OF THE EARTH ROOM FROM NYC TACO. PHOTO OF RUBEN OCHOA EXHIBIT FROM PETER BLUM WEBSITE. With "Art Museums" showcasing toilets as sculpture and elephant poop as art you'd think you could just throw some dirt in a room and call yourself an artist. Wait, (shocking) that has already been done here in NYC. Actually twice. In fact - even stranger - twice on Wooster street, to be exact. Yesterday while strolling through west Soho, I visited two, totally separate, galleries that were each a large room full of dirt. 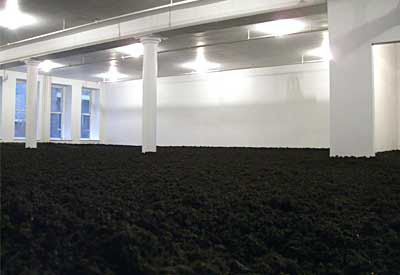 The Earth Room at 141 Wooster street fills the entire second floor with about a yard deep of dark rich earth, or 280,000 pounds of it. The gallery has a wonderful mossy earthy smell, much like the smell of old houses in the East in the humid summer months. I have to say that it was an interesting and usual site - quite a weird juxtaposition of an urban Soho loft with the expanse of natural earth unnaturally filling the space. The dirt is very dark, soft and fertile looking. Apparently they mist the dirt and rake over it several times a week to keep it in shape. The Earth Room opened and has not been altered since 1977, and so I wondered, quite practically, if the floor of the loft has decomposed at all? I also wondered if gallery viewers are ever tempted to throw a handful of seeds across the art? One also inevitably thinks about what a large and beautiful Soho apartment this would be sans the dirt. The second stop on Wooster street was the Peter Blum Gallery, just south of the Patagonia store. 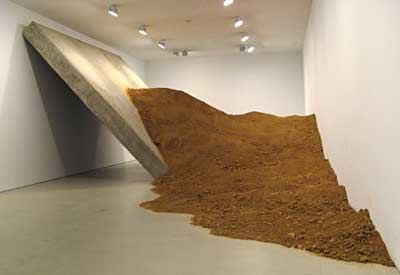 The one-room gallery simply holds one large slab of concrete leaning against the wall, with mounds of dry reddish looking dirt piled against the concrete. This dirt is entirely different, instead of looking rich and agricultural it had the feeling of dirt dug up at a construction site and left to bake dry in the sun. The interesting thing about this exhibit is its theatrics of presentation: You can walk under the exhibit to the back side to see how it is constructed. Like a theater set, the "concrete" slab is a hollow prop. The "mounds" of dirt aren't really mounds, but instead just a thin layer of dirt spread across a hollow hill of wire mesh and canvas. Both are open to the public. The Earth Room, by Walter De Maria is open Wednesday - Saturday noon-3:00pm and 3:30-6:00pm. It is closed during the summer months. The Peter Blum Gallery is located at 99 Wooster St. and is open Tuesday - Friday 10:00-6:00 and Saturday 11:00-6:00. The exhibit of dirt in the Peter Blum gallery is by Ruben Ochoa and is showing until July 24, 2009.